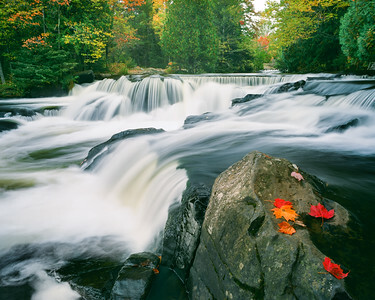 The Upper Peninsula of Michigan has nearly 200 named waterfalls and somewhere in the ballpark of 324 total falls. Many of these falls are in remote locations well off the beaten path and require a little effort to get to while others are right off the parking lot and quite easy to get to . Some large, some small and some are more like rapids but equally impressive in their own way regardless. I've put together a small collection of some of my favorites. I think these falls in particular have just a little more character than most.... through my eyes atleast. 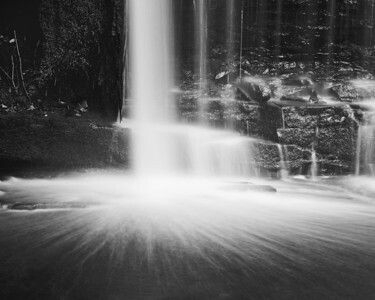 Waterfalls are probably my most enjoyable subjects to shoot. There are so many compositional possibilities, it's too easy to get carried away and loose yourself for hours setting up different compositions. But I've found that shooting waterfalls is much like shooting any other scene in landscape photography: the best shots come in low light, and the same is true for waterfalls, the ideal time is while the sun is getting near the horizon or just rising above. Mid day waterfall shots just don't have the mood, color or contrast that the early morning or late evening light can provide. I hope you enjoy these two pages of Michigan's gems. 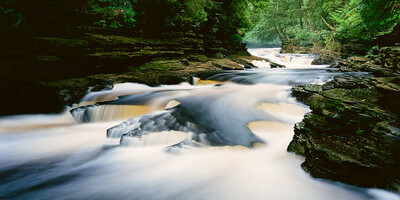 Rock River Falls - Chatham MI Approx 20 minutes SW of Munising MI *For information on purchasing prints and canvas gallery wraps, click the "Purchasing" tab at the top of the page. If viewing on your mobile device, scroll to the bottom of the page and click the "Full Site" tab to view as if you were on your home PC and then go to the "Purchase" tab to for purchasing info. In mobile mode, you will not see the standard navigation bar with the "Purchase" tab. 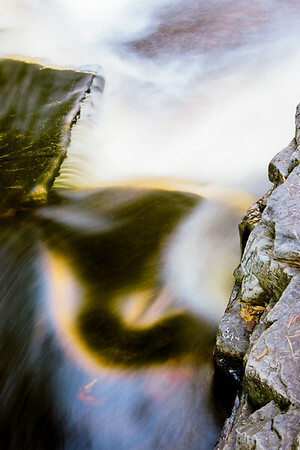 Close up section of Canyon Falls - Just south of L'Anse MI *For information on purchasing prints and canvas gallery wraps, click the "Purchasing" tab at the top of the page. If viewing on your mobile device, scroll to the bottom of the page and click the "Full Site" tab to view as if you were on your home PC and then go to the "Purchase" tab to for purchasing info. In mobile mode, you will not see the standard navigation bar with the "Purchase" tab. Manido Falls Manido Falls is on the Presque Isle River in Porcupine Mountains Wilderness State Park right at the end of County Rd 519 (Thomaston Rd) about 20-25 minutes north of Wakefield. *For information on purchasing prints and canvas gallery wraps, click the "Purchasing" tab at the top of the page. If viewing on your mobile device, scroll to the bottom of the page and click the "Full Site" tab to view as if you were on your home PC and then go to the "Purchase" tab to for purchasing info. In mobile mode, you will not see the standard navigation bar with the "Purchase" tab. Autumn reflection of a sunlit maple in the Sturgeon River near Canyon Falls 15 minutes south of L'Anse on US41. *For information on purchasing prints and canvas gallery wraps, click the "Purchasing" tab at the top of the page. If viewing on your mobile device, scroll to the bottom of the page and click the "Full Site" tab to view as if you were on your home PC and then go to the "Purchase" tab to for purchasing info. In mobile mode, you will not see the standard navigation bar with the "Purchase" tab. Presque Isle River and autumn reflections in the Porcupine Mountains Wilderness State Park in the western UP of Michigan *For information on purchasing prints and canvas gallery wraps, click the "Purchasing" tab at the top of the page. If viewing on your mobile device, scroll to the bottom of the page and click the "Full Site" tab to view as if you were on your home PC and then go to the "Purchase" tab to for purchasing info. In mobile mode, you will not see the standard navigation bar with the "Purchase" tab. 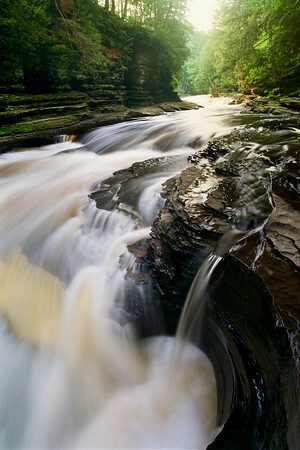 The last 2 miles of the Presque Isle River is probably my favorite stretch of any river to photograph. With in a couple miles, there are numerous sections of falls and rapids that are accessible from trails on both sides of the river. 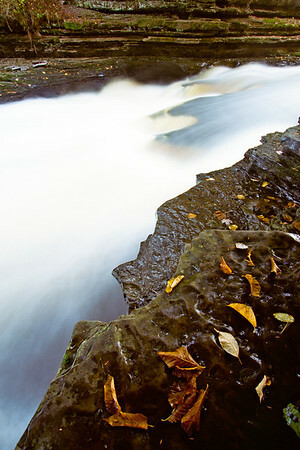 This photograph is of the last set of falls just before the Presqe Isle River dumps into Lake Superior. When the river runs low, this particular section reveals a unique area of smooth, round "potholes" in the riverbed that was created by over thousands of years of constant swirling water. This section of river is located on the west side of the state in the Porcupine Mountains Wilderness State Park right at the end of County Rd 519 (Thomaston Rd) about 20-25 minutes north of Wakefield. *For information on purchasing prints and canvas gallery wraps, click the "Purchasing" tab at the top of the page. If viewing on your mobile device, scroll to the bottom of the page and click the "Full Site" tab to view as if you were on your home PC and then go to the "Purchase" tab to for purchasing info. In mobile mode, you will not see the standard navigation bar with the "Purchase" tab. The Presque Isle River just before it dumps into Lake Superior. This section of river is located on the west side of the state in the Porcupine Mountains Wilderness State Park right at the end of County Rd 519 (Thomaston Rd) about 20-25 minutes north of Wakefield. 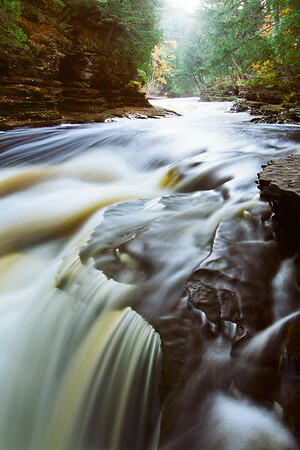 This shot is from a return visit to Tannery Falls in Munising early one morning just after the sun came up. The reason it was a return visit is because I attempted to shoot this on a Sunday morning and there were just too many photographers for me to be able concentrate enough to get a decent shot.... (30 of them!). So I came back on a Monday morning and there were no photographers at all in that small canyon (thank God). I had this shot all planned out from the previous visit and was really excited to photograph it because I knew the morning sun would come blasting through the autumn colored trees. It was a tough exposure to pull off because the sky and trees were so bright, it would be hard to get any detail in the canyon walls. I bracketed my exposures and I used a couple Graduated Neutral Density to correct for the way film (or a digital sensor) records the contrasting light, and it came out alright. Tannery and Upper Tannery Falls is off H-58 in Munising. Where H-58 and Sand Point Rd meet, there is a small trail and a set of steps that leads uphill and to the falls. Tip: Dont park on H-58, the police dont like it lol, You can park on Sand Point Rd near the corner and walk across H-58 from there and on up to the falls. You can't tell from this shot or any of my others because of my compositions and lens choices but, Tannery falls is approximately a 40ft drop. *For information on purchasing prints and canvas gallery wraps, click the "Purchasing" tab at the top of the page. If viewing on your mobile device, scroll to the bottom of the page and click the "Full Site" tab to view as if you were on your home PC and then go to the "Purchase" tab to for purchasing info. In mobile mode, you will not see the standard navigation bar with the "Purchase" tab. A close up of the last set of falls on the Presque Isle River just before it dumps into Lake Superior. This section of river is located on the west side of the state in the Porcupine Mountains Wilderness State Park right at the end of County Rd 519 (Thomaston Rd) about 20-25 minutes north of Wakefield. *For information on purchasing prints and canvas gallery wraps, click the "Purchasing" tab at the top of the page. If viewing on your mobile device, scroll to the bottom of the page and click the "Full Site" tab to view as if you were on your home PC and then go to the "Purchase" tab to for purchasing info. In mobile mode, you will not see the standard navigation bar with the "Purchase" tab. Tahquamenon Falls and fireweed. 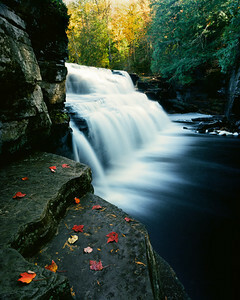 Tahquamenon Falls is located about 10 minutes west of the small town of Paradise on M123. *For information on purchasing prints and canvas gallery wraps, click the "Purchasing" tab at the top of the page. If viewing on your mobile device, scroll to the bottom of the page and click the "Full Site" tab to view as if you were on your home PC and then go to the "Purchase" tab to for purchasing info. In mobile mode, you will not see the standard navigation bar with the "Purchase" tab. Wagner Falls This is one of my favorite waterfall shots. I made it to here just in time to get the sun burning through the foggy haze that floats at the top of the falls. 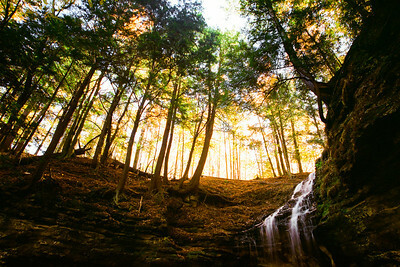 Wagner Falls is located just a few minutes south of Munising, on the east side of MI-94 just south of the MI-28/MI-94 junction. It's an easy few minute walk max. 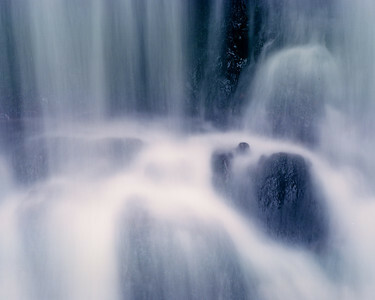 In this photo, from the top to the bottom of the falls is approximately 20 feet. 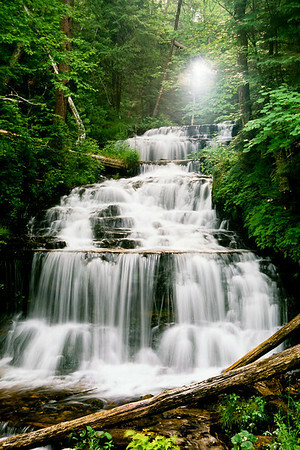 There are some smaller falls above above that are not visible. *For information on purchasing prints and canvas gallery wraps, click the "Purchasing" tab at the top of the page. If viewing on your mobile device, scroll to the bottom of the page and click the "Full Site" tab to view as if you were on your home PC and then go to the "Purchase" tab to for purchasing info. In mobile mode, you will not see the standard navigation bar with the "Purchase" tab. 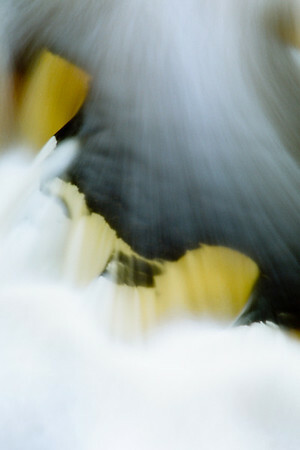 This is a reflection of the blue sky and the yellow and green trees in some rapids along the Presque Isle River in the western Upper Peninsula of Michigan. I used to think you needed the blue/gold filter to create this look or you needed to do some sort of digital color editing in post processing but i learned that you can do this in the right spots at the right times of day. A little effort and it's there for the taking. No filters and no color editing. Pure Michigan reflection. Kodak Ektar 100 and my old Minolta in it's panorama format. *For information on purchasing prints and canvas gallery wraps, click the "Purchasing" tab at the top of the page. If viewing on your mobile device, scroll to the bottom of the page and click the "Full Site" tab to view as if you were on your home PC and then go to the "Purchase" tab to for purchasing info. In mobile mode, you will not see the standard navigation bar with the "Purchase" tab. Upper Tannery Falls.... That's what I call it anyway. It's just a small section of cascade maybe 3-4ft tall (at the most) above the larger Tannery Falls. I showed up to photograph Tanner Falls and I was amazed to find at least 30 photographers all jammed into that small canyon all taking practically the same shot. Since everybody was down at the bottom taking the (same) shot, i scaled up on the canyon wall and took a vertical panorama shot you can find on the next page. After i pulled that shot off i continued on up the canyon wall and back around and behind the main falls and found this small little waterfall. The best part is that i was the only one up there. I spent about an hour up there playing with different angles and this one ended up being the nicest. It made for a nice pic w/the autumn colors back lit by the morning sun. 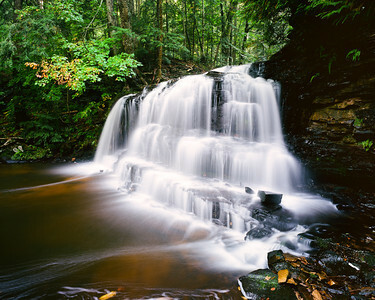 Tannery and Upper Tannery Falls is off H-58 in Munising. Where H-58 and Sand Point Rd meet, there is a small trail and a set of steps that leads uphill and to the falls. Tip: Dont park on H-58, the police dont like it lol, You can park on Sand Point Rd and walk from there. *For information on purchasing prints and canvas gallery wraps, click the "Purchasing" tab at the top of the page. If viewing on your mobile device, scroll to the bottom of the page and click the "Full Site" tab to view as if you were on your home PC and then go to the "Purchase" tab to for purchasing info. In mobile mode, you will not see the standard navigation bar with the "Purchase" tab. 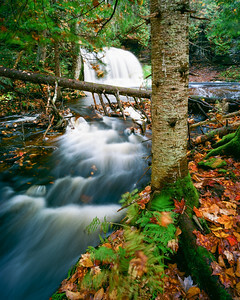 The last stretch of falls as the Presque Isle River dumps into Lake Superior in Michigans Upper Peninsula at the Porcupine Mountains Wilderness State Park *For information on purchasing prints and canvas gallery wraps, click the "Purchasing" tab at the top of the page. If viewing on your mobile device, scroll to the bottom of the page and click the "Full Site" tab to view as if you were on your home PC and then go to the "Purchase" tab to for purchasing info. In mobile mode, you will not see the standard navigation bar with the "Purchase" tab. Canyon Falls - Just south of L'Anse MI *For information on purchasing prints and canvas gallery wraps, click the "Purchasing" tab at the top of the page. If viewing on your mobile device, scroll to the bottom of the page and click the "Full Site" tab to view as if you were on your home PC and then go to the "Purchase" tab to for purchasing info. In mobile mode, you will not see the standard navigation bar with the "Purchase" tab. The Presque Isle River just before it dumps into Lake Superior. This section of river is located on the west side of the state in the Porcupine Mountains Wilderness State Park right at the end of County Rd 519 (Thomaston Rd) about 20-25 minutes north of Wakefield. *For information on purchasing prints and canvas gallery wraps, click the "Purchasing" tab at the top of the page. If viewing on your mobile device, scroll to the bottom of the page and click the "Full Site" tab to view as if you were on your home PC and then go to the "Purchase" tab to for purchasing info. In mobile mode, you will not see the standard navigation bar with the "Purchase" tab. Miners Beach Miners Beach Falls is at the far east end of Miners Beach. Miners Beach is located at the end of Co Rd H-13 north-northeast of Munising MI on Lake Superior. *For information on purchasing prints and canvas gallery wraps, click the "Purchasing" tab at the top of the page. If viewing on your mobile device, scroll to the bottom of the page and click the "Full Site" tab to view as if you were on your home PC and then go to the "Purchase" tab to for purchasing info. In mobile mode, you will not see the standard navigation bar with the "Purchase" tab. Autumn at Tahquamenon Fals *For information on purchasing prints and canvas gallery wraps, click the "Purchasing" tab at the top of the page. If viewing on your mobile device, scroll to the bottom of the page and click the "Full Site" tab to view as if you were on your home PC and then go to the "Purchase" tab to for purchasing info. In mobile mode, you will not see the standard navigation bar with the "Purchase" tab. 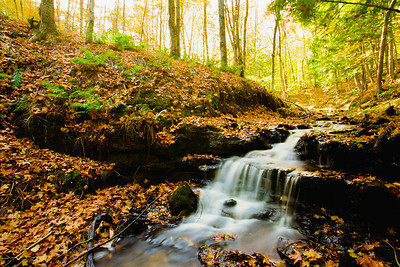 Wagner Falls Munising MI *For information on purchasing prints and canvas gallery wraps, click the "Purchasing" tab at the top of the page. If viewing on your mobile device, scroll to the bottom of the page and click the "Full Site" tab to view as if you were on your home PC and then go to the "Purchase" tab to for purchasing info. In mobile mode, you will not see the standard navigation bar with the "Purchase" tab. Tahquamenon Falls If you catch Tahquamenon Falls early enough in the morning, you can catch this awesome light. There's enough open space in front of the falls that the early morning light comes in almost horizontally from the east, blasts the face of the falls and just touches the front of the rapids casting shadows behind them for just a few minutes. 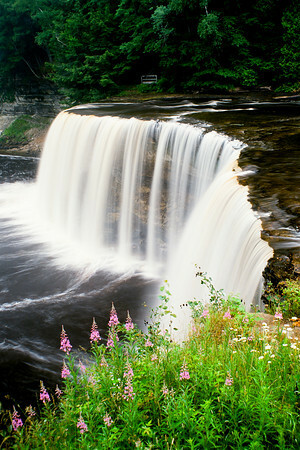 Tahquamenon Falls is located about 10 minutes west of the small town of Paradise on M123. *For information on purchasing prints and canvas gallery wraps, click the "Purchasing" tab at the top of the page. If viewing on your mobile device, scroll to the bottom of the page and click the "Full Site" tab to view as if you were on your home PC and then go to the "Purchase" tab to for purchasing info. In mobile mode, you will not see the standard navigation bar with the "Purchase" tab. Presque Isle River An area of Presque Isle River where the autumn colors created a photo worthy reflection on the water. *For information on purchasing prints and canvas gallery wraps, click the "Purchasing" tab at the top of the page. If viewing on your mobile device, scroll to the bottom of the page and click the "Full Site" tab to view as if you were on your home PC and then go to the "Purchase" tab to for purchasing info. In mobile mode, you will not see the standard navigation bar with the "Purchase" tab. 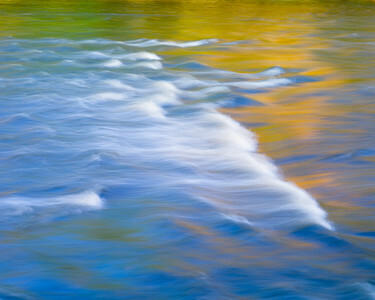 This is a reflection of the blue sky and the yellow and green trees in some rapids along the Presque Isle River in the western Upper Peninsula of Michigan. I used to think you needed the blue/gold filter to create this look or you needed to do some sort of digital color editing in post processing but i learned that you can do this in the right spots at the right times of day. A little effort and it's there for the taking. No filters and no color editing. Pure Michigan reflection. Kodak Ektar 100 and my old Minolta in it's panorama format.